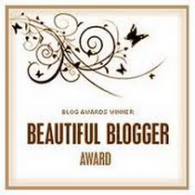 I was recently awarded the Beautiful Blogger Award by The Healthy Warrior. I am honoured and shocked, frankly, as I don’t generally think of myself as beautiful 😉 A big thank you to Carolyn the healthy warrior, whose blog and story are inspiring. The rules state I’m to copy the blog award above into my post, thank the awarder and link back, and then pass it on to seven beautiful bloggers. It’s my pleasure to comply.